Trakr was originally trained in the Czech Republic before joining the Halifax Regional Police in Nova Scotia at the age of 14 months. In the six years before 9/11 he was instrumental in locating contraband, finding missing persons, and hunting down criminals. 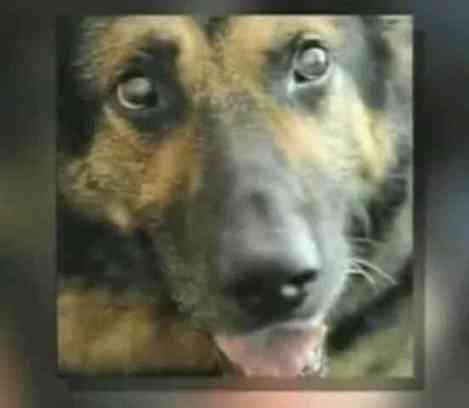 He was retired in May 2001 as retribution against Symington for preventing senior officials in his department from taking on a policy to euthanize Trakr and other retiring police dogs. When Symington and Trakr saw the devastation in New York on that morning they headed out to help in any way they could. They arrived on the morning of 9/12 and went right to work. Trakr found Genelle Guzman, an assistant with the Port Authority of New York, who had been trapped in the rubble for 26 hours. Trakr at Ground Zero (You Tube Image)On September 14, Trakr collapsed from smoke inhalation, chemical exposure, burns, and exhaustion. He was treated and released to return home to Canada with Symington. The pair moved to California where Symington has taken up a career in acting. He has appeared on soap operas and other television dramas. Later Trakr suffered from degenerative myelopathy, a neurological disease that caused him to lose the use of his hind legs. This condition may have been caused by inhaling smoke at Ground Zero. Symington took Trakr to Pawspice, a California end-of-life organization that serves as a hospice for pets and an animal oncology consultation service. Pawspice outfitted Trakr with a cart so that he could power himself with his front legs. In 2008, as Trakr was getting to be an old dog, Symington discovered a contest being held by BioArts International that was looking for the world's most "clone-worthy" dog. He entered the contest with an essay about Trakr and won. His prize was free cloning of his amazing canine. While awaiting his prize, Symington was sad to lose his best friend in April of 2009 at the age of 14. Just two months later he received five puppies, Trustt, Solace, Valor, Prodigy, and Deja Vu. All of the pups were clones of Trakr. Some animal welfare groups, including the ASPCA, question cloning and suspect the possibility of health issues arising in the animals from the process. For Symington the puppies are Trakr, the next generation, and his heart is filled with love times five. Jumpy The Dog Can Write His Own Name -- The Animal Video Of The Day!! !